We came down to South Africa for the Cape Argus Tour. It is the biggest cycling event in the world, probably. On Friday, to stretch out the legs we went on pre-race ride [~130km why not?] to the Cape of Good Hope [I love this name!]. The road by the ocean side was quiet and a lille deserted. Suddenly, I spotted a white ostrich on my left, then this beast jumped on the road from the right and started chasing my friends! It was a little scary at first, but then I thought I gonna fell of my bike from laughter. 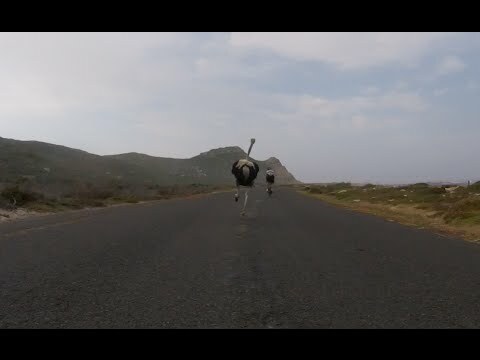 The ostrich didn't have any problem to keep up at 50km/h and apparently they do 70km/h with no sweat. Luckily the creature decided to leave us alone, as we were running out of road. The Cape of Good hope is a dead end way.